The Jelly Cabinet is a unique piece of dining room furniture that was originally created before the invention of the refrigerator. It was built to store homemade jams and pies that needed to be preserved for as long as possible. Today, there is not much need for jelly cabinets, at least not for the traditional purpose of the product, but they are actually still very popular. Newer versions of the vintage jelly cabinet are used for other purposes like as a storage cabinet, a TV stand, or to simply connect people with the past. 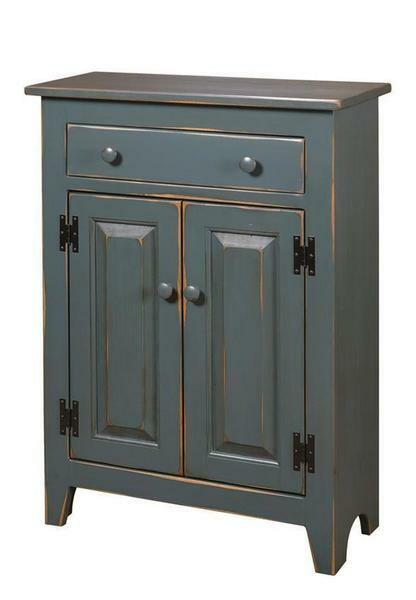 This stunning Jelly Cupboard is shown here with an attractive Colonial Blue painted finish, but can be finished in any of the available paint or stain options for a personalized look that will go great in any home. To have finish samples to be sent right to your home, simply CLICK HERE to order a set of four samples.